Abdul Razak Amissah, manager of Ghanaian Comedian, actor and now musician Kwadwo Nkansah also known in showbiz circle as Lilwin, has rubbished claims that Lilwin tried to buy Patapaaa Amisty’s currently trending ‘one corner’ track. Abdul Razak who is simply known as ‘Zak’, in an interview with Showbiz Network Ghana’s Gabla Godwin on September 17, 2017 explained that there is no iota of truth in whatever rumours was making the rounds. According to him, he first spoke to Patapaa on One Nana Yaw of Multimedia Ghana who is a friend of his’ phone following a discussion they had about the boy’s ‘One Corner’ track during their media tour in Accra to premiere and promote the video for Lil win’s new single, Nyame Gye me. ”Lil win travelled to the U.S.A for a program. When he came back, we picked him from the airport. Myself, Top kay, our two bloggers and our team, we all went and the next day, we were going to premiere our new video for the song ‘Nyame gye me’. In the morning, we went to Tv3 to do the first premiere; the second one was on Multimedia, Adom. When we went to multimedia, it was Nana Yaa’s show. That was when Lil Win started saying ‘One Corner, Two Corner’. I quite remember, Nana Yaa asked Lil Win: ‘’is this your new term or what?’’ And he replied that it is a song oo. After that, we went to countryman Songo’s program and he (Lil Win) said that, Nana Yaw is a brother, a friend, a very good brother of ours. Nana Yaw came to us and he was like ‘’Awww, thank you. Thank you, Zak. Thank you, Kwadwo for mentioning the song on air for us because so far as you mentioned the song, it will surely go far. But I know the boy, he is my boy. So what I want you guys to do is for you to help me promote the boy because he is an up and coming artiste and he has really struggled a lot in life so this is his opportunity. So Lil Win, I am pleading with you to help the boy to come out very big. And Nana Yaw pleaded on behalf of the boy. And Lil Win asked: ‘’you know the boy?’’ and he said yes, I know him. And Lil Win said, No problem. Because of you, let him come so that we do it together. We left that day, we did our promotions and we came back to Kumasi. ‘’ He narrated. ‘’Nana Yaw called me later and said Oh Zak, the Patapaa boy, I called him and told him about what we discussed and about the collaboration. And I said oh, so where is he? Then he said he was there with him so I can even talk to him. So, Patapaa took Nana Yaw’s phone and the first thing he said was ‘Wob3 ti’ and I said ‘One corner’. He greeted and I responded. Then he said he had heard my name several times but has never met me so he was very happy when his boss called him and asked him to come, he was so happy and that’s why he came to his (Nana Yaw’s) house. God bless you. ‘’I can’t wait for Lil Win and Patapaa on ‘one corner. It would be a massive hit. 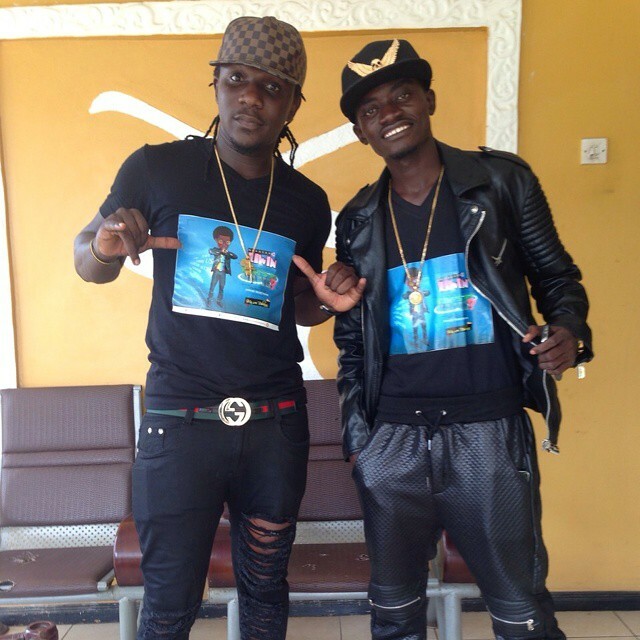 Lil Win is my mentor, I am his diehard fan,’’ he said and I said oh okay, don’t worry, we shall see you soon. That was our conversation. The following two days, Nana Yaw called me again and he was like the boy is pressuring him for my number and that the boy gave him pressure to give him Lil Win’s number. But he told him that if he calls Lil Win with a strange number, he wouldn’t pick. But somehow, he did he give him Lil Win’s number. The boy said he called him severally but he didn’t answer. So he (Nana Yaw) gave him (Patapaa) my number and so I should also take his number so that when he calls, I would know that it is him. I said Nana, because it is from you, that is okay with me. So I was driving to a studio on the next Saturday when I got a call and it was Patapaa on the line. I called him back and after greeting, I asked him that who produced the track? And he said it is one of his friends. So I told him to get the data from the studio and come to Kumasi because Lil Win would only be working on Tuesday. So he should come because Lil Win said after doing the song, he would shoot the video for him. Then the boy said he would go to the studio instantly. That was the last time I heard from him till Sunday. Even on Sunday, it was after Lil Win asked of his whereabouts that I called him and he told me the producer wasn’t around and he (Patapaa) also went for a program so he would get back to him. I then told him to feel free and come so he would sleep in Lil Win’s house and have one-on-one with him. That was the last time I had a chat with him.’’ Zak continued. According to Zak, he called Patapaa’s manager who was only named as Godfred, a sales person at multimedia. He said during the call, there were controversies regarding the mode of the collaboration. Patapaa’s manager was not comfortable with the proposal that the collaboration be made either Patapaa X Lil win or Lil win X Patapaa. He wanted it to be a feature, that’s Patapaa featuring Lil win. As such, he (Zak) told Godfred that he would have to discuss with his team to find out if that would be okay before he gives him feedback. He was therefore surprised to hear the news that his artiste wanted to buy the song. ‘‘According to the manager, it is as if Kwadwo wants to take the song from the boy. And I said no. It is not possible because the song is out there already and other people are also doing remixes of it. How can Kwadwo take it from him? Moreover too, that song is originated by somebody. And I know the originator is a northerner. He took the beat from the original and added his words. The only thing is that his is making the Waves now. And that is because the original song is in one of those northern languages. And even, Lil win mentioned it during Nana Yaa’s show. Many people watched that and there were people in the studio too. So how can he take the song?’’ An angry Abdul Razak Amissah fumed. On the other hand, Nana Yaw confirmed on a similar interview earlier that he had met Patapaa during a program at Swedru where he performed his One Corner song. According to him, he took interest in the song, edited a portion of it and posted it on Facebook. Haven done that, he caught the attentions of Dr.Pounds and Dj Wobete who promised to help promote the song. He therefore deemed it a big opportunity when he saw Lil Win speak about the song on the show. That was how come he linked Patapaa up with Lil Win to help him up the ladder. He explained that he was completely devastated by the news, knowing that he was the one who introduced the guy to Lil Win and Zak. When asked if this would affect any future request from anyone for him to help an artist, Zak said it would need serious thinking. However, the songwriter, producer and artist manager said he had dropped earlier plans of taking legal actions against the ‘One Corner’ King following several calls and pleas from friends and families asking him to do so. He has however indicated that his relationship with Nana Yaw could not be jeopardized by the current events and that they are still cool. On new projects, Zak hinted of his new song which he would produce and release soon as well as some other projects with some top Ghanaian musicians such as Kofi Kinataa and Ghana’s enviably most decorated rapper, Sarkodie. Meanwhile, all attempts to reach Patapaa proved futile.